In today’s high tech world—where even email threads seem archaic in comparison to a Google hangout—the continued merits of business travel are up for debate. 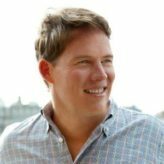 Ask the salespeople and the dealmakers, and they’ll laugh in the face of the modern digital landscape. In their world, nothing beats an in-person meeting when a deal is on the line and you’re looking to close. But does that triumph outweigh the mental and physical strain of balancing on-the-go with on-the-job? Business travel comes with some serious costs—and we’re not talking about the toll it takes on the company card. From the fast and fried food consumed in airports, to the lack of exercise one gets when staying at hotels, to the stress and dehydration (and imbibing!) that tends to comes hand in hand with trips—there’s no denying that the health-minded business traveler has plenty to gripe about. Luckily, the trend toward wellness continues to be on the rise. The Global Wellness Institute estimates that the “workplace wellness” and “wellness tourism” industries pulled in 43 billion and 563 billion, respectively, in 2015. Has the hospitality sector noticed? You bet. A growing number of hotels are enabling health-conscious business travelers to keep up with their at-home habits even while on the road. Sure, meetings all day followed by a much-deserved martini (or two) and a steak dinner will always have its place among many a business traveler. But for those who opt for a more balanced lifestyle while away, an array of healthy options—from yoga and meditation, to spas and green shakes—are showing up at more and more hotels and resorts. Turnberry Isle Miami – Miami, Fla.
Tucked away on 300 tropical acres between Miami and Fort Lauderdale, Turnberry Isle Miami is a tropical oasis with a culture of authenticity and an itinerary of enriching experiences. 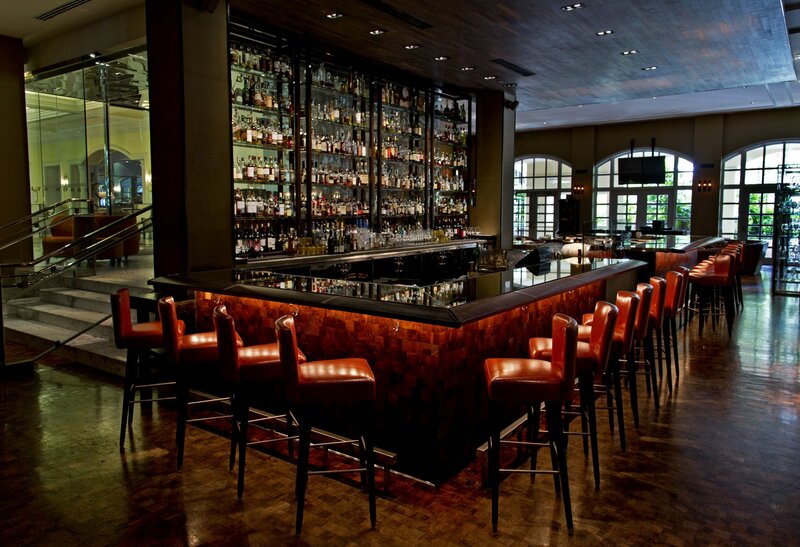 The resort is renowned for its two championship golf courses redesigned by Raymond Floyd, celebrity chef Michael Mina’s award-winning BOURBON STEAK restaurant (below), and the elite Cañas Tennis Academy. 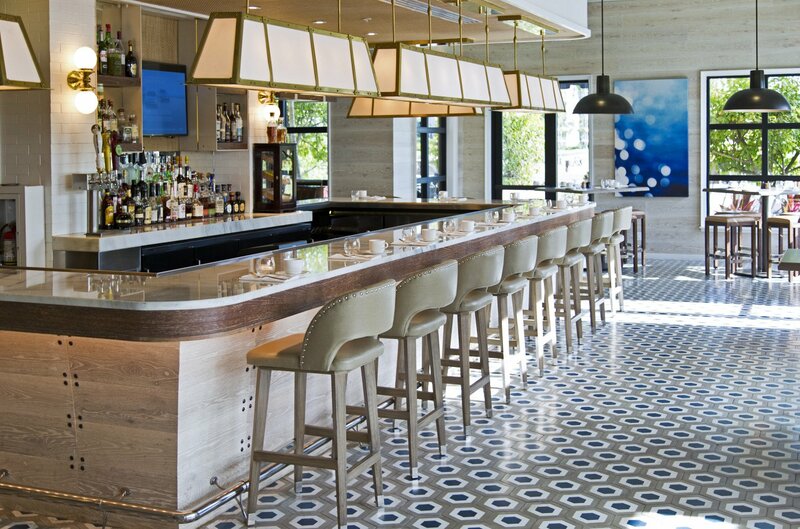 Fresh features on property include dining destination CORSAIR kitchen & bar (above) and the newly renovated three-story âme Spa & Wellness Collective. All the above, and two relaxing pools to boot, are within walking distance of their 398 spacious guest rooms and suites. There is no doubt this is a multi-faceted resort, perfect for family vacations, golf outings or the simple weekend retreat. 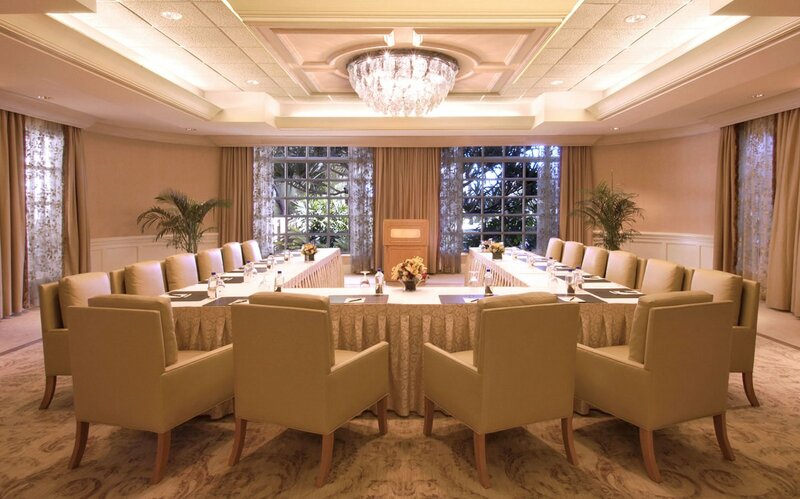 But with 40,000 square feet of meeting space that blends seamlessly into the exterior, Turnberry Isle also yields a full-fledged convention center, perfect for conferences and large-scale business retreats. And it is not uncommon at all for the various salon rooms to transform from meeting spaces in the morning to yoga or meditation rooms in the afternoon. During a break from the panel in Conference Room B, one might be offered healthy alternatives such as a yoga class or wellness seminar in salon 8. Rather than the usual buffet meal or check-your-email-in-the-lobby distraction, a healthy lunch is available. This builds team culture and keeps people healthy, which a lot of employees want while traveling and which group insurance plans now prioritize. Of course, for those business travelers who spell health in less social, group-oriented ways, there is always âme. Turnberry Isle’s new luxury, full-service spa and wellness collective offers an integrative wellness program personalized to every guest and member. Its wellness program is curated by a collective of forward-thinking global practitioners and is at the vanguard of both Eastern and Western modalities. âme offers integrated strategies that allow clients to manage stress, encourage strength and flexibility, lose weight, cultivate equanimity, look and feel younger, and create new patterns that can last a lifetime—all within a supportive community. September 8-10, âme will offer a three-day retreat lead by Master Yoga Teacher Nikki Costello. A former contributing editor at Yoga Journal and one of 2016’s 100 Most Influential Yoga Teachers in America, Costello curates a weekend of bliss for the yogi’s soul. If mellowing out with some stretching, spa treatments, wellness circuits, group discussions, and nutritious yet delicious fare sounds like the perfect group bonding session for your team, contact a Spa âme-bassador today. 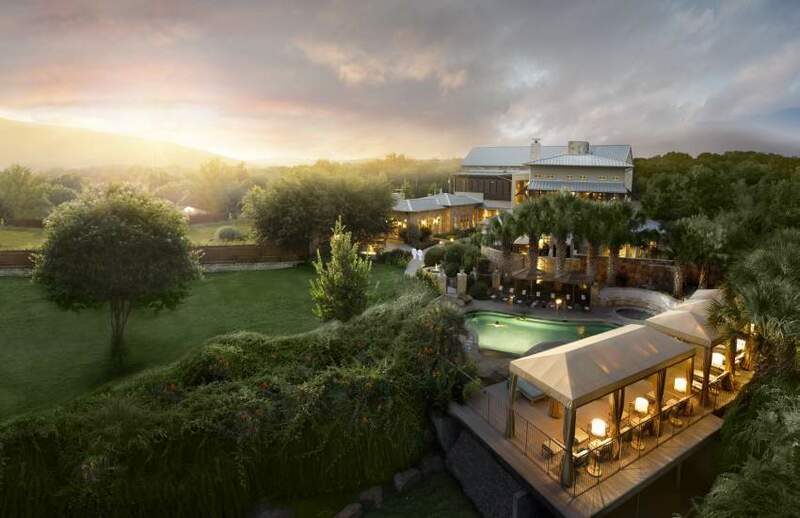 Holistic spas are popping up around the country and one of the best is the LakeHouse Spa at the 19-acre, bucolic Lake Austin Spa Resort in Austin. 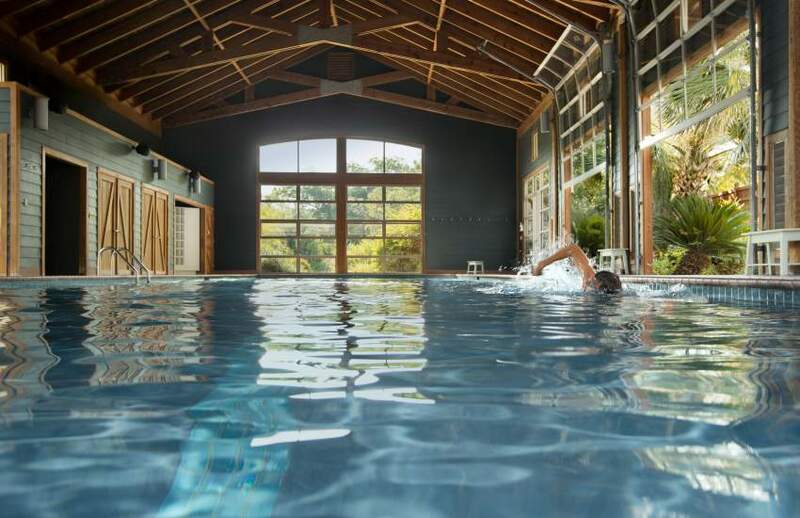 The 25,000-square-foot renovated facility has 30 treatment areas (some situated in the picturesque garden), an outdoor pool, an indoor lap pool, a hot tub and cabanas. Choose from more than 100 spa and salon treatments, many of which are based on ancient therapies, including Ayurveda, Moortherapy and Thalassotherapy. Many of the herbs used in treatments are grown onsite at the resort’s Healing Gardens. Opt for the Bamboo Bliss massage or the Texas Sage Herbal Infusion body treatment. Lake Austin believes in using your body’s defenses to keep illness at bay. Instructor Paul K. Smith teaches specialty yoga classes that allegedly relieve allergies and asthma. Acupuncture is also offered and many spa programs can be tailored to meet the needs of guests who want to decrease stress, lose weight fast or jumpstart their fitness routines. The destination uses its gorgeous setting and immersion in nature to create unique experiences for their business travelers. Trisha Shirey, the resort’s Director of Flora and Fauna, even creates floral arrangements for meetings with fresh rosemary and basil from the organic gardens. Her selected herbs are known to boost mental clarity and focus, and help improve memory. Colleagues can choose to spend their time paddleboarding across the lake, doing laps or simply relaxing in one of the three swimming pools, attending cooking classes, participating in nature hikes or enhancing their stay with some much-needed pampering at the full-service spa. The idea? To return to the office relaxed, rejuvenated and ready to get back to business—a benefit for them and the company. More specifically, the award-winning luxury resort is helping businesses reimagine methods for improving a company’s performance via creativity and innovation—and the pristine lakefront location is an ideal place to do exactly that. After all, when retreat attendees gain enthusiasm that refreshes and recharges both their personal and professional lives, the companies for whom they work inevitably reap the benefits. New on and off-shore teambuilding activities such as Kayak Relays, SUP Board Meetings, Group SUP Paddle Race and Geocaching are quickly replacing the traditional ropes course thanks to year-round water accessibility. In fact, more than 30 new activities have been added to the curriculum this summer in a new series called The Ripple Effect. Bonus factor: exclusivity is guaranteed. 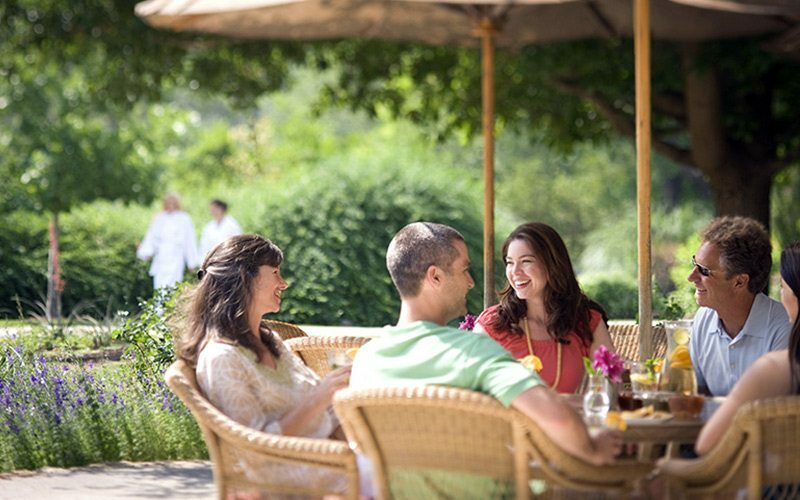 Lake Austin Spa Resort limits corporate retreats to one group at any given time, assuring high-level attention to each and every participant. More than 100 unique spa treatments at the 25,000-square-foot award-winning LakeHouse Spa—and a gorgeously honed atmosphere—are meant to break down impediments to communication and enhance inner life. Participants can take yoga, hiking or fitness classes, and learn about everything from nutrition to meditation. 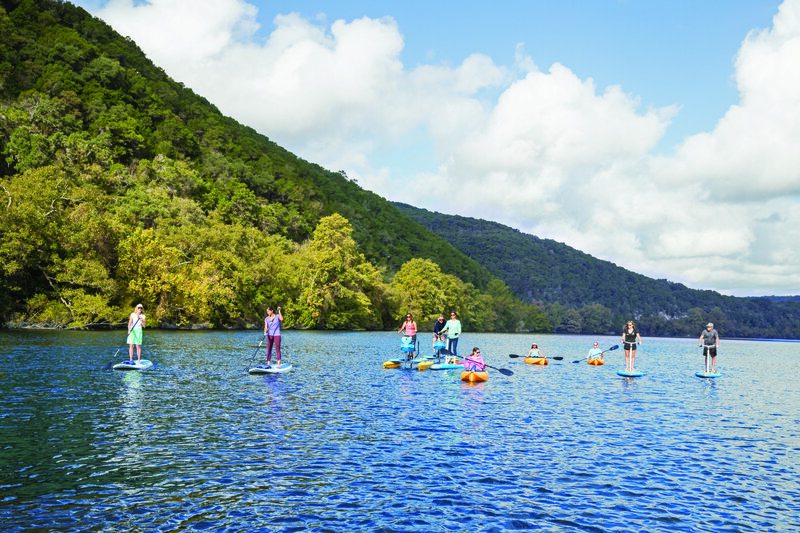 Plus, Lake Austin Spa Resort has something most other places simply do not have—instructor-led water activities on one of Texas’s most pristine and beautiful waterways. The Broadmoor – Colorado Springs, Colo.
A century ago, hotels were built to rival European estates, with hundreds of rooms, sweeping manicured lawns and spectacular vistas. Few of these grand estates remain. While tourists still flock to the Grand Hotel in Mackinac Island, Michigan; The Biltmore in Asheville, North Carolina; The Breakers in Florida and The Greenbrier in White Sulphur Springs, West Virginia, it’s The Broadmoor in Colorado Springs, Colorado, that is the queen of the grande dames, and with good reason. Built in 1918 to mesh European elegance with American spirit, The Broadmoor is still an eye-catching marvel nearly a century later. The Rocky Mountains are visible from almost every spot on the 3,000-acre estate. You catch your breath often, especially if it’s your first visit. The 700-room—101 are suites, some with gas fireplaces—multi-winged main building enthralls hotel guests with its amazing views, attentive service and variety of dining options. If you want a more private abode, head to one of the six expansive Broadmoor Cottages, built in 2009, which are adjacent to one of the three championship golf courses. The Broadmoor is the longest-running consecutive winner of both the AAA Five-Diamond and Forbes Travel Guide Five-Star awards. Since first opening in 1918, The Broadmoor has offered its guests a unique way to experience the beauty of the American West, through its 43,000-square-foot awarding-winning spa (Forbes Travel Guide Five-Star ) as well as their restaurants—Penrose Room is the only Five-Star, Five-Diamond restaurant in Colorado. Add a 54 holes of championship golf, six tennis courts, indoor/outdoor pools, distinctive retail shops, specialty tours, activities and programs for guests of all ages and interests and there’s no shortage of stuff to do. Given it’s size (on 3,000 acres), myriad activities and stunning Rocky Mountain backdrop, it is no wonder The Broadmoor has long been a favorite for group outings. Zen out in an art class or fly-fishing on the nearby Tarryall or South Platte rivers or participate in larger events with colleagues like a golf or tennis tournament. More of an adrenaline junky? The rock climbing sessions will burn calories while helping employees gain head strength and overcome their fears. 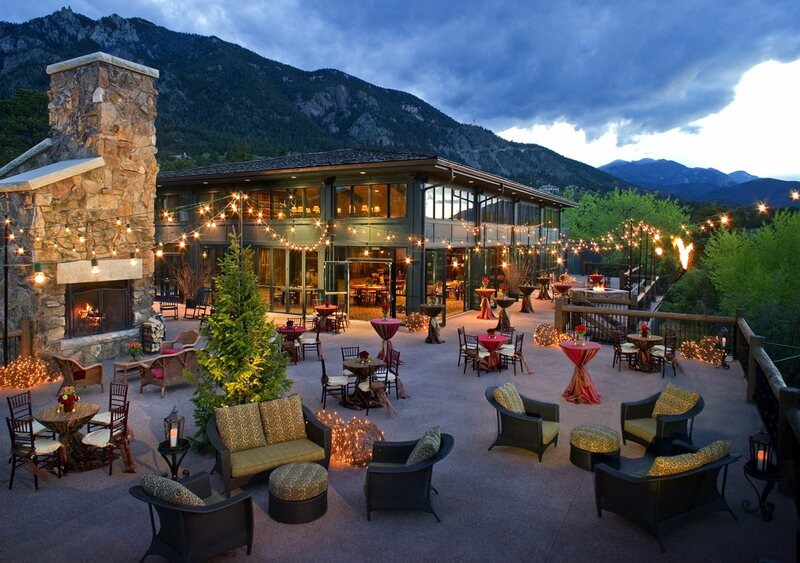 With 185,000 square feet of sophisticated event space and nearly 100 years of award-winning hospitality, The Broadmoor understands the unique needs and attention required to create successful meeting experiences. Meeting specialists are among the resort’s greatest assets and can tailor extensive event offerings to support meeting goals, including advanced audiovisual support and diverse cuisine. 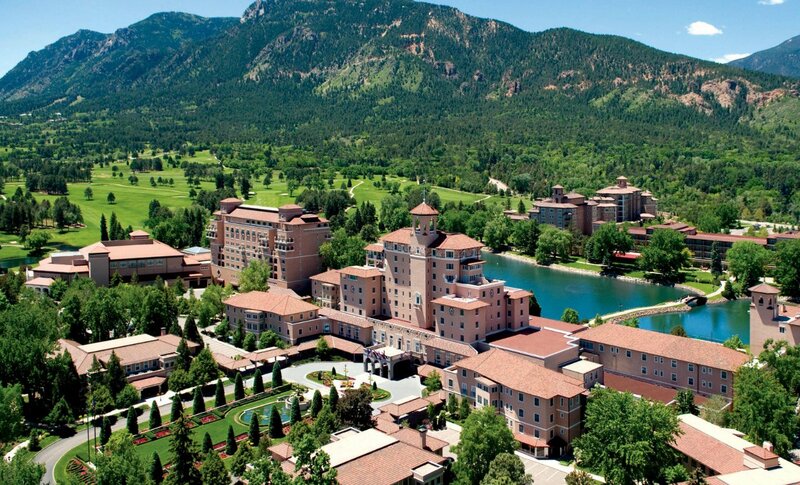 Also, through their partnership with Destination Services Corporation (which has a full-service office less than one mile from the resort), The Broadmoor can provide a spectrum of destination services for meeting planners, corporate travel companies, and incentive groups around the world. Business might be booming, but the great outdoors is calling. Compromise at www.broadmoor.com. 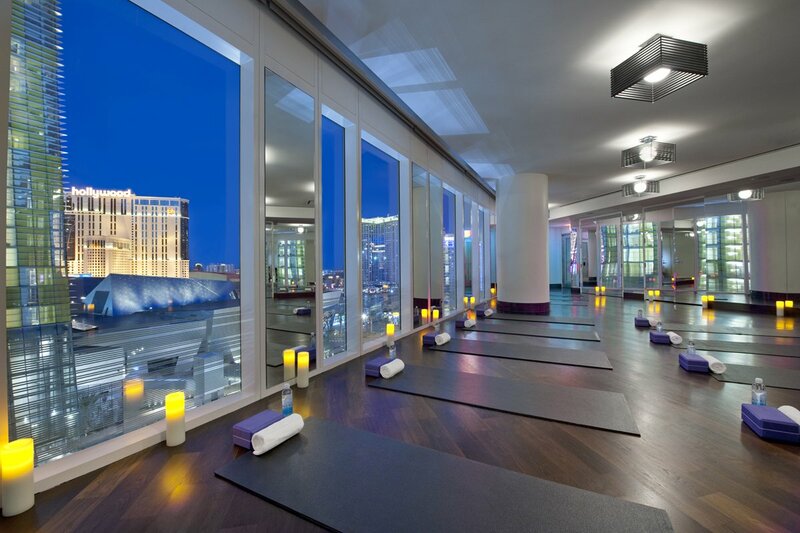 Mandarin Oriental Las Vegas – Las Vegas, Nev.
Yoga is proven to reduce stress, spark creativity, boost your mood, and even help you sleep better. So if yoga is part of your daily regimen, missing your mat time can have ill effects on your mind and body. Fortunately, if you are traveling to Vegas for a conference—which you may be, considering the city hosted 21,864 meetings in 2016—The Mandarin Oriental has you covered. Headed by Resident Yogini and Personal Trainer Mary Jane Kleiman and her 18 years of experience, The Mandarin offers a top-of-the-line yoga and pilates studio on site with a wide variety of classes and times. With experience in pilates, fitness instruction, yoga and gyrotonic instruction, Mary Jane is able to personalize workouts based on the unique needs of guests she interacts with, including large groups. As for the work side of things: The Mandarin is designed to host high-impact events, with function spaces that include a ballroom, executive boardroom and a range of meeting rooms. All of the meeting rooms are located on the same floor, providing seamless transitions between events (including a private entrance that’s separate from the hotel’s main entrance for the extra convenience of employees who may be staying at another hotel). Situated three floors above The Strip and featuring floor-to-ceiling windows with automated blackout shades and an intimate outdoor patio, the Oriental Ballroom is a breathtaking venue. Divisible into three sections, it is suitable for all kinds of events and seats up to 480 guests for dinner. Adjacent to the ballroom lies a grand pre-function foyer perfect for drinks receptions. The Lotus and Jade dual function space can be reserved individually or combined for up to 56 guests. Flooded with natural light, these rooms boast state-of-the-art technology, including complete wireless interface with sophisticated lighting and audio-visual possibilities such as slideshows and music. 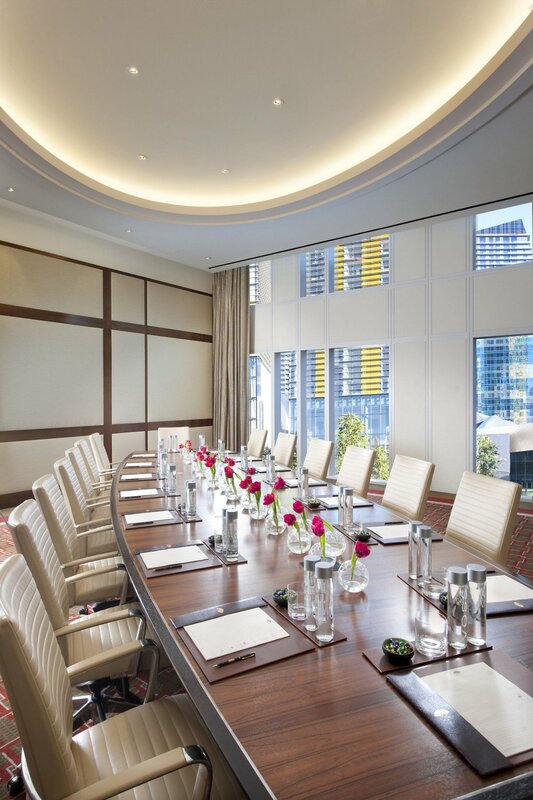 The Mandarin “Boardroom” is one of the most impressive executive boardrooms in Las Vegas, with seating for up to 20 guests. Flooded with natural light, the boardroom features impressive technology such as surround sound systems to help enhance presentations. Even the pool deck, surrounded by the ARIA Campus and featuring private cabanas and food and drink service, is eligible for corporate event use. Don’t gamble on other Vegas digs—head to www.mandarinoriental.com/lasvegas. 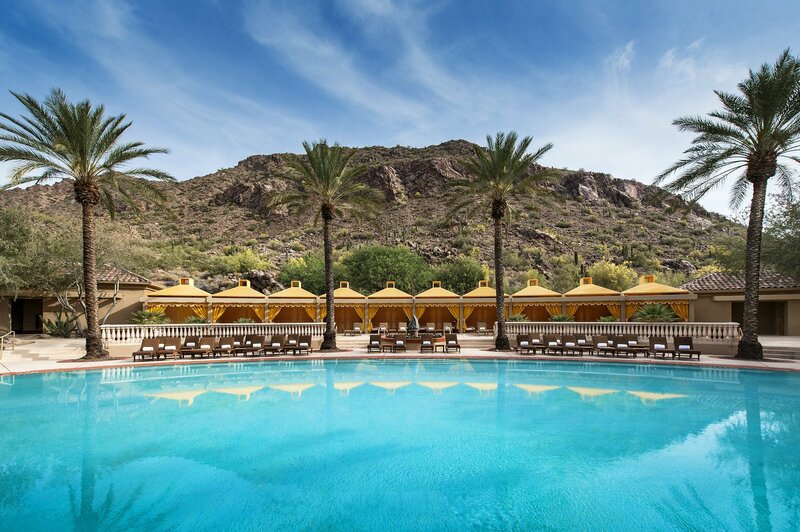 The Phoenician – Scottsdale, Ariz. The Phoenician, a Forbes Travel Guide Four-Star desert oasis just outside Phoenix, is no newcomer to handling corporate retreats.From its inspiring Sonoran surroundings to its freshly remodeled accommodations that allow you to stay anew, The Phoenician provides both the essential setting and AAA Five Diamond service for meetings and special events. Whether small, executive gatherings or grand affairs, the resort’s diverse venues, exquisite culinary experiences, contemporary guestrooms and signature amenities create a luxurious backdrop to the iconic hospitality you have come to expect. And when you’re not doing stuff with your colleagues, you’ll have myriad options for sun and relaxation. Aprés sport, the spa at the Phoenician, is a must try. Called the Centre for Well-Being, the 22,000-square-foot complex offers everything you could want to make your stay just a touch—or a whole lot—more relaxing. Breathe deeply, and enjoy herbal body treatments and energy therapies in one of the 24 treatment rooms, or take advantage of the full-service fitness area. Home to an aerobic studio, weight room and more, it provides state-of-the-art equipment for every workout style. The Scottsdale resort also offers three restaurants, 27 holes of championship golf and an 11-court tennis facility, and nine—yes NINE—swimming pools. The Mother-of-Pearl tiled “relaxation pool” is the main event for adults seeking pure serenity. And after a long day of activities, The Phoenician will have you and all your co-workers covered for dinner with nine—yes NINE (again)—dining options. Choices range from the elegant—J&G Steakhouse (a Jean-Georges Vongerichten restaurant) and The Praying Monk (Italian with a working wine cellar)—to the more casual—Relish Burger Bistro, which has the charming distinction of housing the largest tequila collection in the state of Arizona. Of course, company retreats usually involve some indoor time too, whether it be team building exercises or meetings to discuss real business items. With more than 120,000 square feet of interior/exterior meetings and event space, The Phoenician can accommodate groups of all sizes – from small, high-level executive gatherings to grand affairs for 2,500. 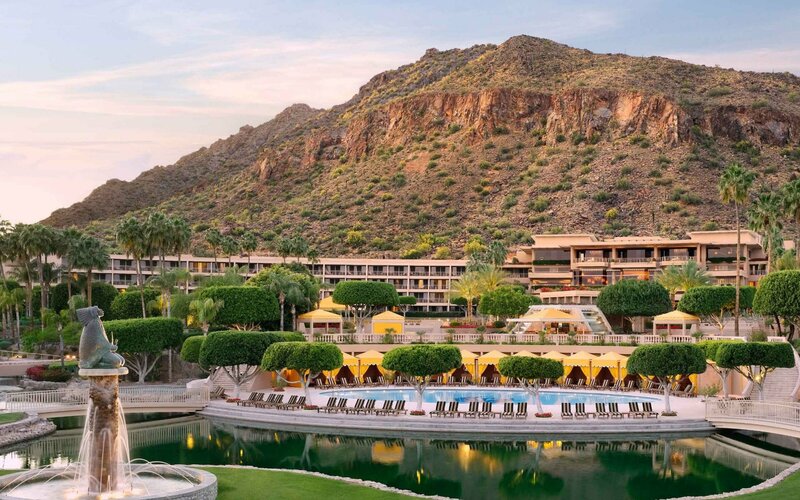 The centerpiece of the resort’s meeting facilities is the contemporary, 15,000 square-foot, Camelback Ballroom, complemented by the traditional 22,000 square-foot Phoenician Grand Ballroom. Cutting-edge audiovisual capabilities are showcased in the 5,270 square-foot Estrella Theatre. For smaller meetings, the Red Rock Boardroom, located inside The Canyon Suites, features the latest technological advancements, such as a hand-crafted mahogany conference table seating 24 with eight, 21-inch flat screen monitors that rise from the tabletop. With some much-needed desert sun, good eats, exercise and plenty of pampering, you’ll return to work relaxed and recharged. Head to www.thephoenician.com and you might feel better already.